Austrian crane hire and heavy haulage specialist Felbermayr recently brought to work the new Liebherr LR 11000 crawler crane for the first job. The new crawler crane left the Liebherr works in Ehingen heading directly to the first job site close to Bucharest. The crane was ordered for the Petrom refinery in Plojesti in order to lift divers columns for the modernisation of the refinery. The heaviest lift was a 58 meter long column with an actual weight of 335 tonnes. Initially the weight was specified with 280 tonnes. But though the column was 55 tonnes heavier than planned the LR 11000 had enough reserve to place the metal cylinder safely and finish the lift with a gross weight of 357 tonnes at a working radius of 27,5 meters. For this lift Felbermayr has used a Liebherr LR 1750 as tailing crane. The great challenge for the Felbermayr crew was the very restricted space for the rigging of the Liebherr crawler crane and for the lifts within the plant. Even more critical was the fact that all crane rigging and heavy lifts had to be executed while the refinery was fully in operating state. With the compact dimensions of the LR 11000 the crane appeared to be engineered especially for these kinds of jobs. The crane was rigged with 36 meters of luffing jib, 250 tonnes of counterweight on the upper structure and 450 tonnes suspended ballast. 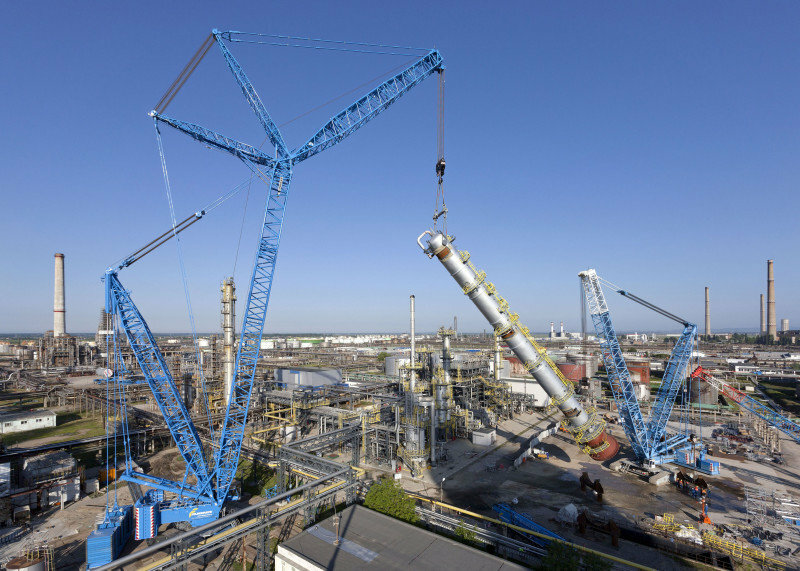 The Felbermayr crawler crane will stay in the Petrom Refinery and will execute further heavy lifts until the end of July. During the ongoing complete plant shut down further new parts will be installed and old ones will be removed. The Liebherr LR 11000 crawler crane was first introduced in April 2013 at the BAUMA trade fair in Munich. It can be equipped with a maximum of 108 meters of main boom and 114 meters of luffing jib.